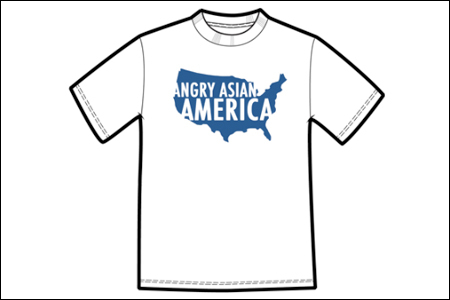 Courtesy of the Angry Asian Man, who has also provided a video explanation of this shirt. You can buy it today at Black Lava’s shiny new site. I sense that there is a thread of experience in the face of class warfare, represented here. I'd like to say that even some of us honkies get to deal with class warfare, on the receiving end. To that, I'd like to mention that even German immigrants were discriminated against, in historic Chicago - to which end, I cite the documentary, Chicago: City of the Century, which has showed on PBS. I don't believe that it has been too often recognized that class warfare is a factor, even in a modern nation. I don't mean to dilute the argument, either. I haven't had a lot of experience on the receiving end of race-related prejudice. In considering what I have experienced, that I know of, I've come to believe that there is a measure of class-based prejudice, entailed with what becomes expressed as race-based prejudice. Being of the most popular skin-color, in the nation, so far and supposedly -- I'm actually a sort of mutt, though my skin tone would seem to suggest that I'm of some sort of so-called Caucasian lineage -- it may seem I would not often be in the "minority race", however that would work. Yet, there are still places where I am in the minority. It makes for a great opportunity to check on what attachments I've made, myself, wittingly or not -- but, I digress. A person's individual racial identity is such that a person can become attached to. I don't claim to never be attached to my own, but I don't play political games, for it. I believe it's where racial politics is introduced into the human experience: Right at the margins of conflicts between individual and group-consensus racial identities. You know what? I am guilty! I have frequently asked that question, although slightly differently. The result is the same. Because my question arises from a desire to know one's ethnicity, not where they're "from." And so I ask it very awkwardly. But I can visualize the many times I have done that. "Where are you from?" "I'm from Seattle." "I'm sorry, I meant to say what is your background, your ethnicity?" And now I realize that while that may be a valid question to ask someone after you've known them for a while, it certainly is inappropriate to ask upon a first meeting. When someone meets me for the first time and asks where I'm from, they don't follow up with, "What is your ethnicity, your country of origin?" It may be a topic of a future discussion when we know each other, but as a first question? Now I am aware of just how inappropriate my inquiry has been (not to mention selfish). There's plenty of class-based prejudice. Lower-class white people experience it. So do lower-class non-white people. Unfortunately, in the mainstream media, class discrimination is usually portrayed as something that only happens to lower-class white people. Racism is a great distractor from class issues because it tends to makes white people resentful of lower-class non-white people, who are usually portrayed as getting some kind of "special privileges" even when they have they face equal or greater class discrimination than lower-class white people. The "where are you from" inquisition always makes me angry too, because when people don't accept my first answer, they are accusing me of lying to them. I'm not a dishonest person and I don't appreciate being accused of dishonsty. When I say I'm from somewhere, that's what I mean. "But what's your REAL favorite color?" "Sigh. Look, I don't care what your favorite color is. The question I asked you was actually a completely different question in disguise, and you should have picked up on that and answered the completely different question. Instead, you're embarrassing me by taking my question at face value. I'm going to try again. What's your favorite color? And by that, I mean, are your parents divorced? Now stop making things hard on me and answer my real question before I get even more embarrassed." @atlasien: It's been my honest impression that the media -- X-percent of the entertainment media, at least, and I would say that includes Y-percent of coverage from the FOX News channel, for example, not as if red states were all to blame about it, though -- that the media, as a norm found across partisan borders, portrays class prejudice as something to be desired -- even when that's only been presented as a matter of "class self image", viz a viz, marketing techniques, portrayed to a target "market image". I think it's alarming, honestly, and I also find it to be offensive, ultimately belittling to the very notion of human significance. I'm afraid it's not just staying on the TV, any more -- if it ever was. And yet, what is one person to do about it, but to try to be true? At least, there are plenty of recreational opportunities available, outside of any regional hotbeds of prejudice. It makes for something worthwhile to do, I think.